The ninth-ranked UCSD women’s water polo team returned home after a three-game road trip to beat 22nd-ranked California Baptist 7–6 Saturday afternoon at UCSD’s Canyonview Aquatic Center. The nonconference matchup had the Tritons on their toes as the Lancers kept the score between one or two points the entire game. However, UCSD prevailed in the end, clinching the Tritons’ fourth straight win. Prior to the start of the game, UCSD had studied and prepared for Cal Baptist. The game plan proved to be successful, as the first quarter saw Evans shut down and the Tritons exhibit stellar defense. Their high pressure led to the Lancers overthrowing several passes and missing all six shots, three of them blocked by senior goalkeeper Courtney Miller. 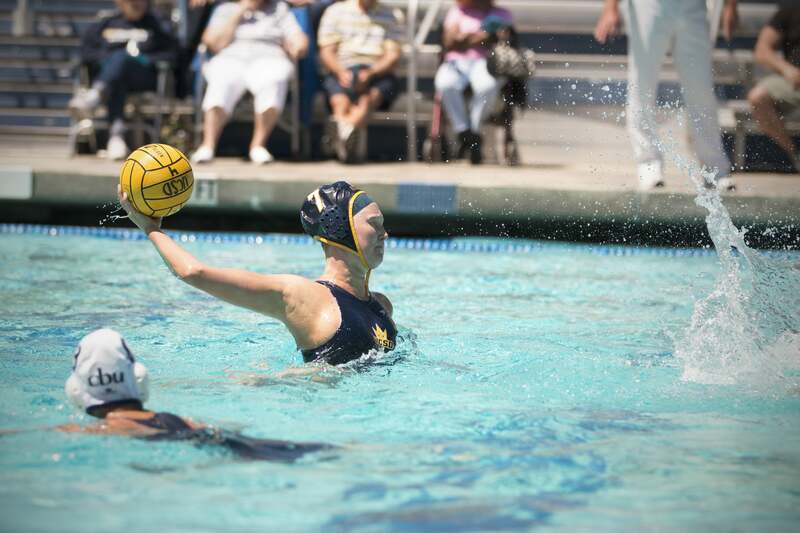 Senior attacker Laurel Kistler scored the first goal halfway through the quarter for the Tritons. After redshirt junior two-meter defense Alexis Wieseler stole the ball and drew a foul, she lobbed the ball to the awaiting Kistler. Kistler, who had swum across the pool and was prepared for the counter, fired a bullet to the top right corner of the goal and scored. UCSD’s second goal came through the strength of senior attacker Julia Kirkland. While being swarmed by a defender and Cal Baptist’s goalie, Kirkland managed to swim out of the scuffle within the five-meter line and backhand the ball into the goal. At the end of the quarter, UCSD had a satisfying 2–0 lead. The Tritons maintained their lead at the half when both teams scored two points in the second quarter. Team high-scorer Wieseler got her first of two goals in the game with a skip shot on a penalty shot after Kirkland was fouled within the five-meter line. UCSD scored again on a counter when Kistler passed the ball to a speedy junior center Lauren Boyer, who managed to shoot the ball past the arms of Cal Baptist’s junior keeper Meghan Rowland. The Lancers’ first goal came on a power play. With a woman up, Cal Baptist’s junior driver Paizlee Dreyer set the ball for senior two-meter Hannah Evans, who shot and scored on the bottom right of the goal. The second point came on a similar instance but with freshman driver Lizette Perez lobbing the ball over Miller and into the goal. UCSD led 4–2 by the half. The tag team of Kistler and Boyer struck again at the beginning of the third quarter. Kistler, with her second assist, set up Boyer within five meters of the goal. Boyer then catapulted the ball for her second point of the game. The Triton’s sixth point of the game came on a powerplay. They worked the outside by continuously passing the ball around. Senior attacker Emma Sasson found a gap in the wall and sneaked the ball to sophomore utility Kayla Fedler, who scored. Cal Baptist’s lone goal of the quarter came from redshirt senior utility Laura Kocsis, who threw a dart at the top left post from 10 meters out. After six minutes of play in the fourth quarter, the Lancers were the only one to have scored but still trailed 6–4. The game was suspenseful in the last couple of minutes. Evans dwindled the gap even further with a backhand goal. The Tritons responded with an insurance run from Wieseler. With 1:06 left on the clock, Wieseler scored from 10 meters out and made the score 7–5. The Lancers weren’t done yet, though. Cal Baptist kept the Tritons shuffling around until they found a chink. Perez scored from the corner of the goal with 36 seconds left to play. Following the goal, the Tritons killed the clock by moving the ball around, out of reach of the Lancers. Cal Baptist recovered the ball with two seconds left of play but were unable to come out with a goal, solidifying UCSD’s win to 7–6. The Tritons managed to stay ahead of the Lancers the entire game, even when Cal Baptist began to come alive. In total, UCSD made seven out of 27 total shots. UCSD, now 23–9, look to battle their rival, San Diego State, now 15–14, on Friday at 6 p.m. The Tritons will host the Aztecs in the last regular season game and will also attempt to reclaim the Harper Cup.